What is Shrink-Wrap? Why should you Consider it for your Printing Orders? Shrink-wrap is a polymer plastic film that shrinks when heat is applied to it. It is a widely used packaging option. As it shrinks, the film conforms to the shape of the item being packaged, totally enclosing it and securing it tightly. Shrink-wrap is thin but durable. Sometimes referred to as shrink film, shrink-wrap is used extensively in the commercial printing industry to package printed matter. Many printed pieces are shrink-wrapped in bundles but some projects require each item to be shrink-wrapped individually. A chipboard backer is often shrink-wrapped with the printed pieces to add rigidity. 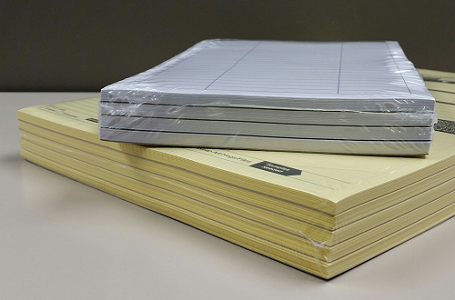 Books, Manuals, Catalogs, Calendars, Notepads, Brochures, Flyers, Postcards, Letterhead, Door Hangers, Binder Page Sets and many other popular printed items are frequently shrink-wrapped. Shrink-wrapping is considered a Finishing operation and many commercial printers offer it as an optional service. In most cases, the application of shrink-wrap is an automated process, utilizing a conveyor belt that passes through a heat tunnel. Shrink-wrapping can also be performed manually using a hand-held heat gun. Because shrink-wrap secures the printing tightly, it restricts the movement of the pieces. This helps prevent the pieces from rubbing against each other during transit or shifting around within the shipping carton. The clear plastic film totally encases the printing to help shield it from dirt, dust, moisture, and other detrimental substances. Thus, shrink-wrapping is a very simple way to improve the longevity of printed items. Even after months in storage, the printing stays new looking. Printing that is shrink-wrapped in bundles is much easier to handle, store, and distribute than loose pieces. Also, unlike corrugated boxes, the shrink-wrap adds no bulk. Since shrink-wrap is completely transparent, it provides a clear view of the printed items enclosed. For example, a bundle of shrink-wrapped brochures on a shelf can be identified at a glance. Conversely, boxed brochures on a shelf cannot be accurately identified without first opening the box and then looking inside. Printed pieces that are bundled in pre-set packs of 25, 50, or 100 are much quicker and easier to inventory than loose documents. Shrink-wrapped bundles are much more tidy and manageable too, especially for high-gloss printing which has a tendency to slide around because of its slick surface. Shrink-wrapping is a very cost-effective packaging option, probably less than you might think…especially when considering all the advantages and benefits that it provides. If you have any questions about shrink-wrap or would like to learn more about the benefits of shrink-wrapping your print orders, give Formax a call at 866-367-6221. Or, if you have an upcoming print project and would like a quote, click here to submit our easy quote request form. As always, we look forward to assisting with your printing needs!